Luxurious contemporary fittings and classical features come together in the Bathrooms of Cumberland House, an impressive period villa overlooking Kew Gardens. 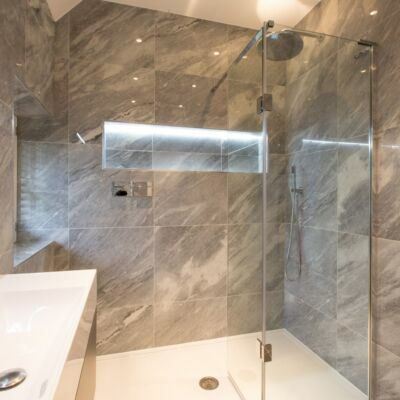 Long-Standing Matki Dealer, PT Ranson worked with project manager and specifier Hilary Scott on this remarkable project, using Matki Shower Enclosures and Brassware across each of the bathrooms. We spoke to Hilary shortly after the project’s completion. What was the brief for the bathroom designs? 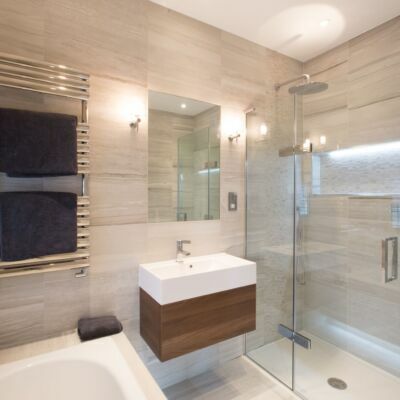 The clients gave me total freedom to select the sanitary ware and fittings for the bathrooms, they wanted a contemporary feel although it is very much a period house. We were looking for quality and simplicity and wanted to use the same fittings in all of the bathrooms. 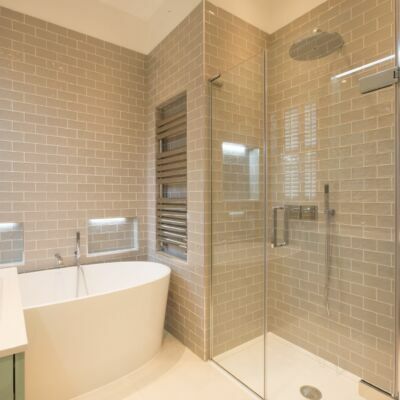 All 8 bedrooms were to have ensuite bathrooms with a further two cloakrooms. 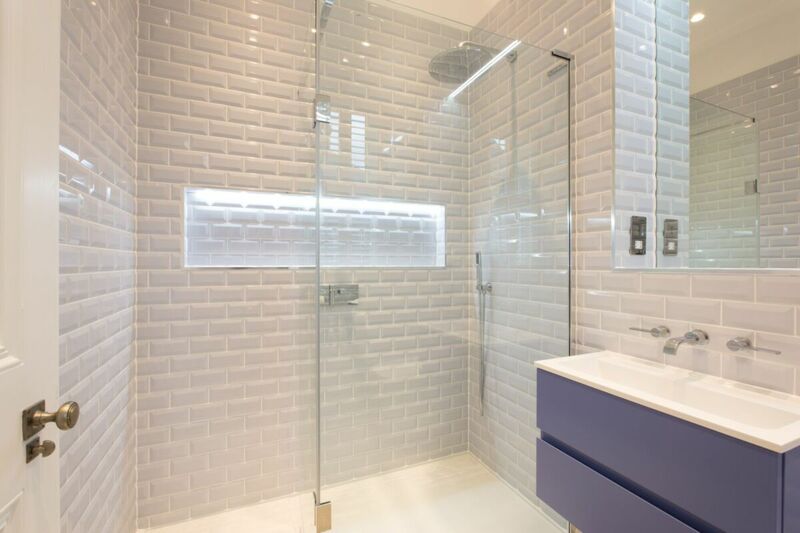 There was to be a uniformity in the design of the bathrooms so the same Shower Enclosures, Taps, Showers and Basin Units were used throughout, different tiles were used to give the bathrooms an individual feel. I worked with Paul Randall of PT Ranson to design each of the bathrooms individually. 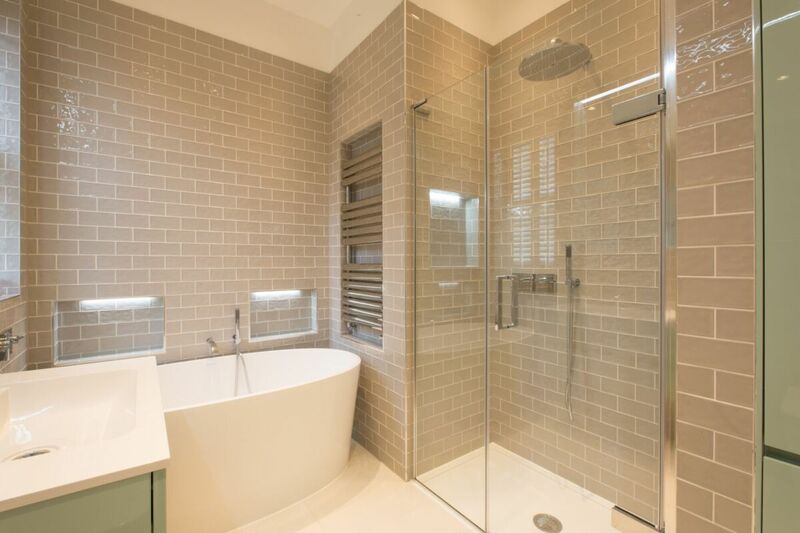 How did the style of the property inform the design of the bathrooms? 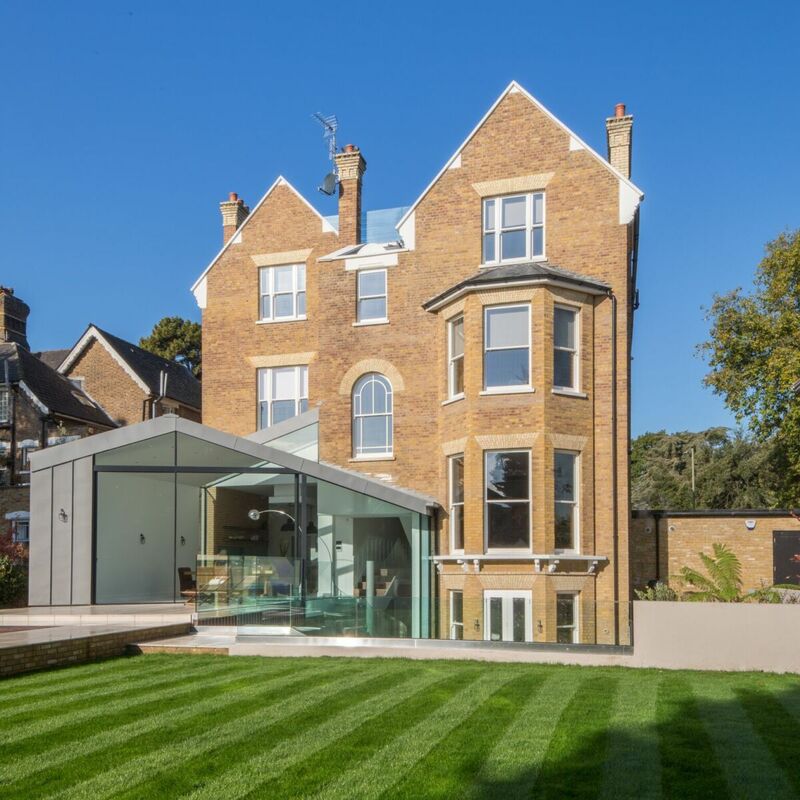 The Property was very much a period House and we wanted to retain the classic feel by reinstating the period features. The proportions of the house were magnificent and we reverted to the original rooms which were large with high ceilings. 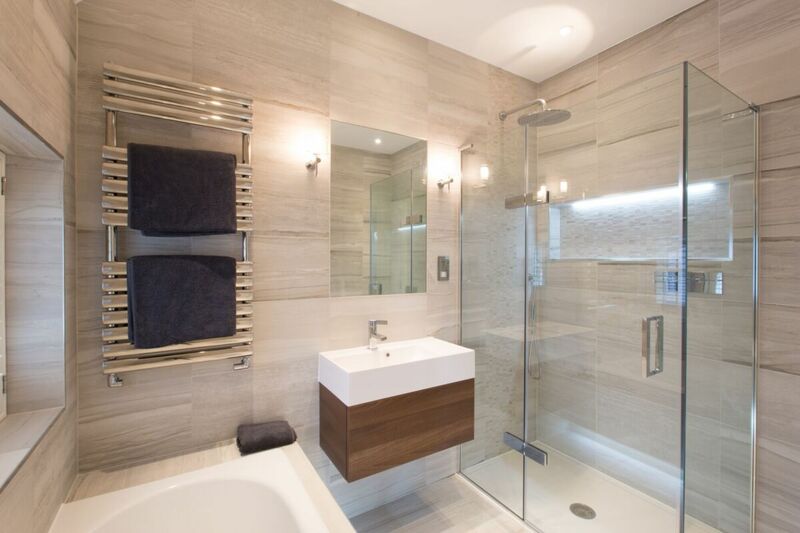 The kitchen and bathrooms were to be contemporary in design but classic, top quality fittings were to be used to reflect the quality of the property. There was to be a simplicity in the design which would not date. 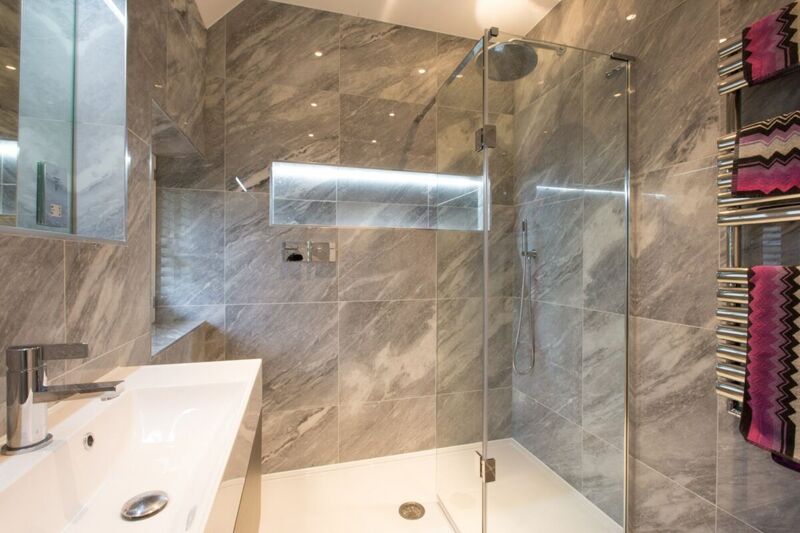 How important was the showering space to the client? 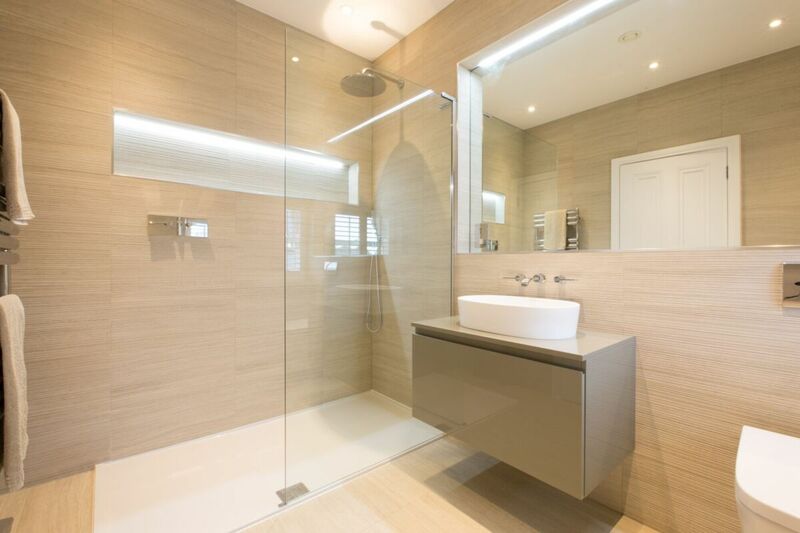 The client wanted large shower enclosures with frameless glass, we wanted white shower trays rather than wet decks but trays were to be level with tiling for a seamless look. 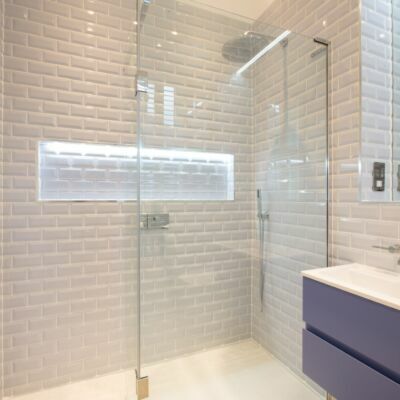 Ceilings were quite high in the bathrooms so large sections of frameless glass worked well for the enclosures. We did not want to have to step up to shower enclosures nor have large profiles for the glass to fit to. Quality and simplicity of design was the main driver for selecting Matki. We selected the Matki Elixir Blade for the shower valves and taps, for a simple yet stylish look to the bathrooms. What were the challenges in designing the Bathrooms? The bathrooms looked quite simple but were actually quite complicated to do. All toilets were wall hung and with wall hung basin units, taps came from the wall. We recessed mirrors and had them templated with shaver sockets cut in. All mirrors had heat mats behind and concealed led lighting. 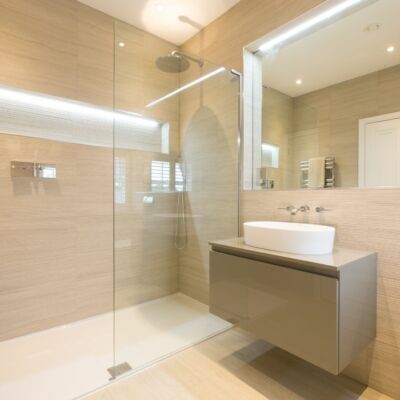 We formed recesses in all the Shower Enclosures which again had concealed led lighting. All bathrooms had underfloor heating and towel rails were dual fuel. As there were so many bathrooms it was quite difficult to work out all of the soil pipe and drainage routes as well as the extraction. We had no pipe boxing of any kind as we wanted totally clean lines so it was difficult to conceal everything. Hilary Scott and Paul Randall of PT Ranson work closely together on the design and planning of many high-end residential bathroom projects. Based in the North-East, PT Ranson, display the most luxurious bathroom brands at their state of the art showroom in Gateshead.